In private Chester Shores Homeowners Association along Loon Lake located off Route 8/9 in Chestertown NY, beautiful 'Haus Cronov' is nestled among the pines on a private road in exclusive neighborhood with beach rights to two private association beaches on Loon Lake. Chalet built in 1989, upgraded with hardwood floors, radiant floor heat and direct vent gas heating stove in great room/kitchen that is adjustable on thermostats, a screened in porch + new kitchen in 2008/2009. A convenient 4.4 mi. drive from Adirondack Northway 87 Exit 25 or downtown village of Chestertown. On-site caretaker explains appliances and heating, for late-night arrivals please see the purple INSTRUCTIONS guide. Of the many ski areas, closest is Gore Mt., a scenic 13 mi. drive, few miles from Hudson River. Bright, clean and cozy 1 1/2 floor wooden chalet flanked by forest area as well as 1-acre front yard. 3 Bedrooms include: 2 Queen beds - master loft-bedroom and brass bedroom; 1 bunk bed + 1 double bed in Kids room; 1single bed in loft. 2 full Bathrooms (2 showers), large + open living/dining/ kitchen area with direct vent gas heating stove, 1 acre front yard, swing in tree for kids play/relaxation, large apron deck on 3 sides with awning-covered dining area of long table for great outdoor grill parties. Modern, well-stocked kitchen. 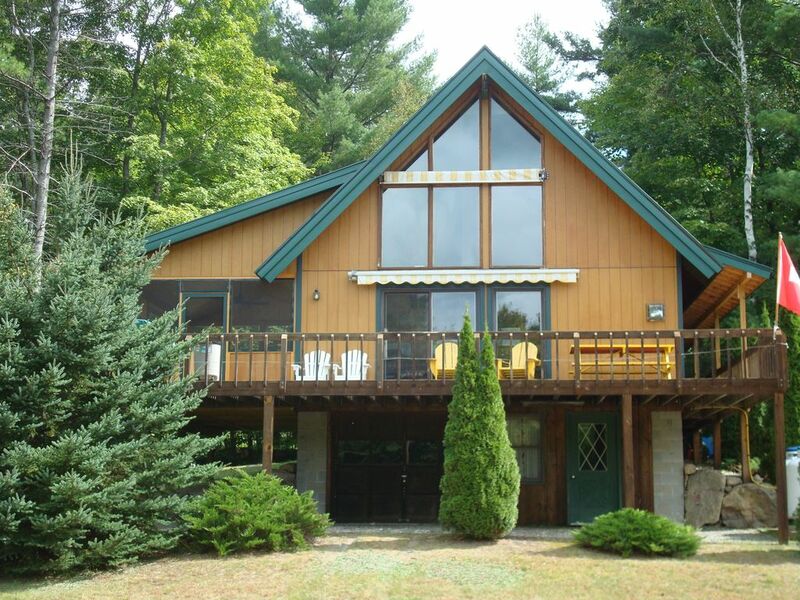 Easy house to maintain, splendid view of Adirondack nature and trees in every season. Two private sandy beaches on Loon Lake available, both within a 5-minute walk along private association dirt roads. Parking available at either beach with guest permit. Good fishing off boat docks, roped-off swimming areas with floating docks, large play and sand area, paved basketball court + beach volleyball court, fireplace + picnic tables at beach, in winter snowmobiling or ice fishing on shallow Loon Lake. In summer a family paradise, in fall a breathtaking foliage experience, in winter a lonesome, romantic winter wonderland, in spring a mt. biking, river-rafting explosion of nature, 'Haus Cronov' provides the ideal background to your vacation. In nearby village is the Chestertown Medical Center, free ski lift, sledding and skating at Dynamite Hill, concerts in the summer, Information Center, quaint gift shops and restaurants, grocery store, etc. This is our heaven on Earth, the pure opposite of city life. Come breath in the magic! Haus Cronov is bright, cozy, comfortable, well stocked and provides a wonderful home-away-from-home atmosphere. It is set up so that everyone enjoys privacy yet also togetherness since all rooms are spacious and comfortable. The gas fireplace turns on at a flick of a switch, the atmosphere created underscores the cozy, bright friendliness of Haus Cronov. The yard is huge, with a flat grassy area approx. 1 acre large, swing,firepit and forest area so that all outdoor summer and winter wishes can be fulfilled. In the forest the kids can play on huge ice-age rock. A small hill creates a great sledding area in winter. wireless phone with built-in answering machine. Also outdoor clothes line for beach towels, etc. Lots and lots of washcloths, towels, bedding, beach towels. spacious fridge with automatic Ice maker and lots of condiments such as mustard, mayo, salad dressings, etc. An electric stove with coil burners. The dining table is generous so can fit up to 10 people easily, the same size table is out on the screened-in porch! Bon Apetite! games, puzzles, card games... come have fun with the family. SKI Gore Mt., just a scenic 13-mile drive.